Skywalker's trail name undoubtedly has something to do with his 6'11" stature. 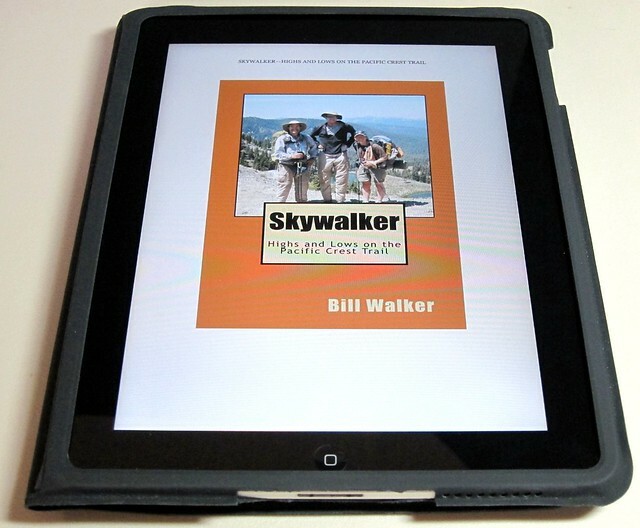 In 2005 the self described average hiker successfully thru-hiked the Appalachian Trail, then he wrote the book "Skywalker–Close Encounters on the Appalachian Trail" which he published in 2008. The following summer he thru-hiked the Pacific Crest Trail, and the experience turned out to be quite different than the AT. I love reading books written by thru-hikers, probably because I aspire to be one some day. Skywalker does a nice job of describing the feeling of life on the PCT, and it isn't always a John Muir love affair of wilderness. He makes some pretty amateur mistakes along the way, and his fear of snakes, bears, icy cliffs, etc. become apparent. This may not be your vision of a mountaineer, but it does show what an average person can accomplish when he puts his mind to it. Since he successfully thru-hiked the AT, you might think the PCT was just another long trail, but it proved to be much more difficult for Skywalker. In the end he did start and finish the PCT, but there were some large sections that he was forced to skip along the way due to injury, fire, and inclimate weather. For me, this wasn't one of those books that's so intriguing that you can hardly put it down, but it is recommended reading for anyone who aspires to hike very long distances. Hs honest, and sometimes self defacing writing style gives you a good dose of the reality of life on a long trail, which I think is an important step in preparing for a thru-hike. Books written by travelers can serve as a guide to action. Skywalker is really very talented approached the descriptions. Reading page after page, you understand that a person is subject to more than he thinks.